Bronson guns down a thug while a tribble lands on his head. 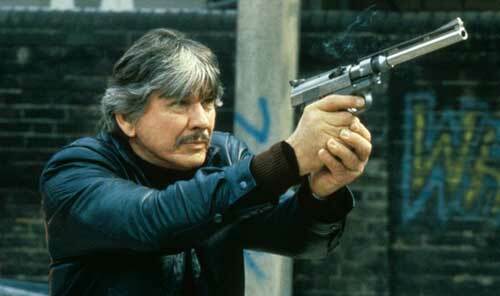 Director Michael Winner (after his slamming take on vigilantism in the original DEATH WISH, 1974), seems to have resigned himself to mediocrity, after the jaw-dropping turd called DEATH WISH II (1982) and now the marginally superior DEATH WISH 3 (even the tags are confused: first Roman numerals and then Arabic). 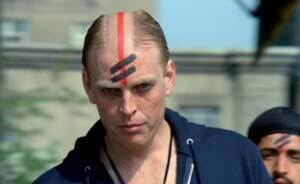 Head thug is Fraker (Gavan O’Herlihy) who looks like the spawn of Jake Busey and a Pat Benatar dancer. All the thugs sport a lively piece of warpaint on their foreheads – to cheesily identify them as thugs. Thank goodness or we would have thought those parachute pants and cutoff midriff shirts and fruity bandannas and chains were the feature in a gay Mardi Gras or an aerobics workout video shoot. And there’s Alex Winter sporting that warpaint! (yes, Bill from BILL AND TED’S EXCELLENT ADVENTURE) – with five lines of dialogue, delivered like a guy who will one day star in BILL AND TED’S EXCELLENT ADVENTURE. But there’s no competition. No matter the lackadaisical nature of the last two HARRY films, none of them were so inexpertly directed and staged as this kill-fest TV movie; no HARRY film had to put up with editing this sloppy, action this badly choreographed and acting this atrocious. Bronson is now 64 years old, and though he’s keeping his body trim and fit, his one-note acting method still doesn’t threaten the Hoffmans or Hackmans. Not even the Christensens or the Keanus. Director Winner is ambitious – he’s trying to stage an apocalyptic reckoning, a battle for the soul of Suburbia, if you will, but he lacks the ability, budget, actors, stuntpeople and crew to make it work. The third act Running and Shooting degenerates to a muddle of arbitrary explosions, people posing and shooting, and people jiggling spastically like a John Woo movie upon being shot. It’s like schoolkids playing cops and robbers. Let me update that to Grand Theft Auto. Only the actors are more human in GTA. Writers: Brian Garfield, Don Jakoby. Starring: Charles Bronson, Deborah Raffin, Ed Lauter, Martin Balsam, Gavan O’Herlihy, Kirk Taylor, Alex Winter, Tony Spiridakis, Ricco Ross.